You Can Also Follow on Facebook, by E-mail or Subscribe for Free Monthly Updates! Do you have a summer pastime or activity you would rather be doing instead of cooking? For me it's biking. I get all fired up during the month of July because the biggest bike race in the world takes place. Watching the Tour de France on TV makes me want to get on the bike and go for a spin. When I'd rather ride than cook, I gravitate towards dishes that come together quickly. 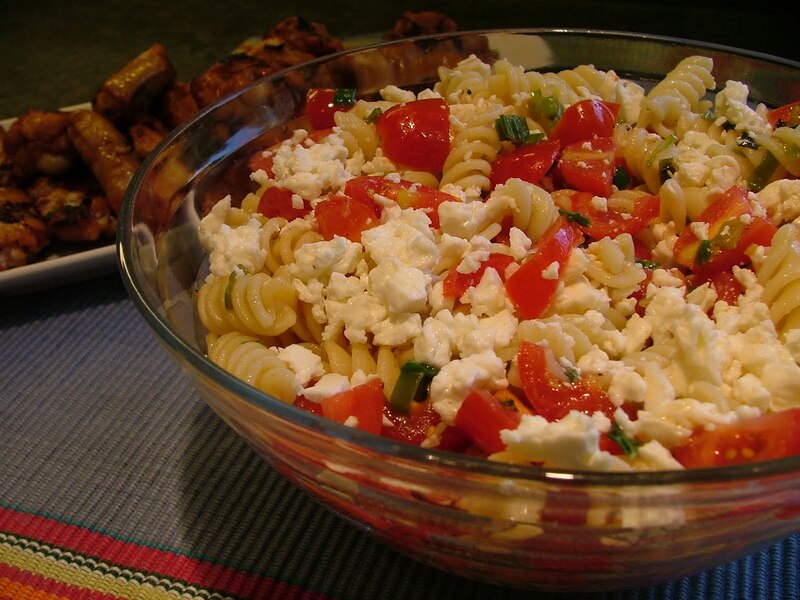 This light Fusilli Pasta with Tomato and Feta is exactly the type of summery dish that won't keep you in the kitchen very long. There's not much cooking involved so if you pair it with fattening chicken wings, like I did, you'll still have time to hop on a bike or do your favorite summer activity to burn off those extra calories. 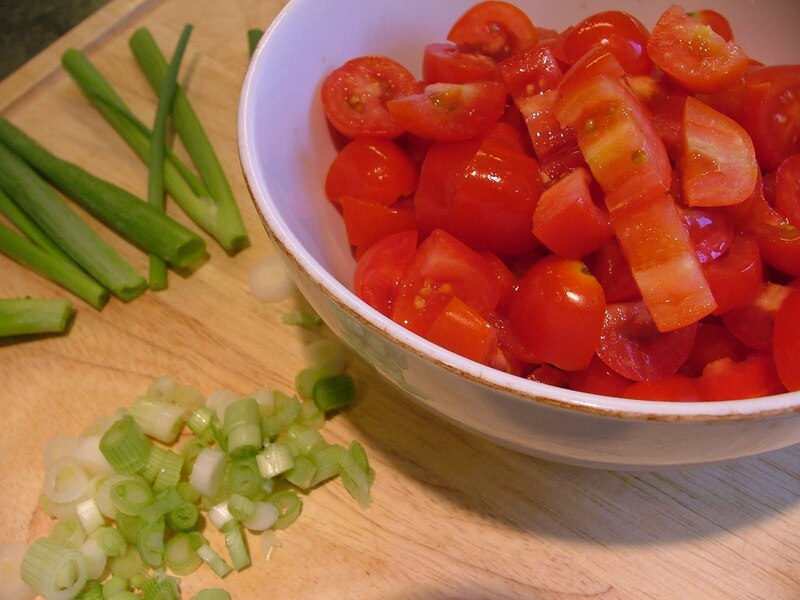 Hip Cooking Tip: Quartering cherry or grape tomatoes can be tedious if your chef's knife isn't super sharp. To easily get through the smooth tomato skin try using a serrated knife instead. Song Pairing: This past weekend the band Soundgarden was in town (I heard the show was awesome) so I'm pairing this dish with their song "Spoonman". I've also chosen this band because I feel like I have a connection with lead singer Chris Cornell, even though I've never met the dude. Get this...we both love music (Soundgarden is one of my all time favorite bands). I work with food and Chris once worked as a fish handler and a sous-chef. Plus the Tour de France ends in Paris, which is where Chris owns a restaurant called Black Calavados. Music, food, Paris...yeah we're connected! 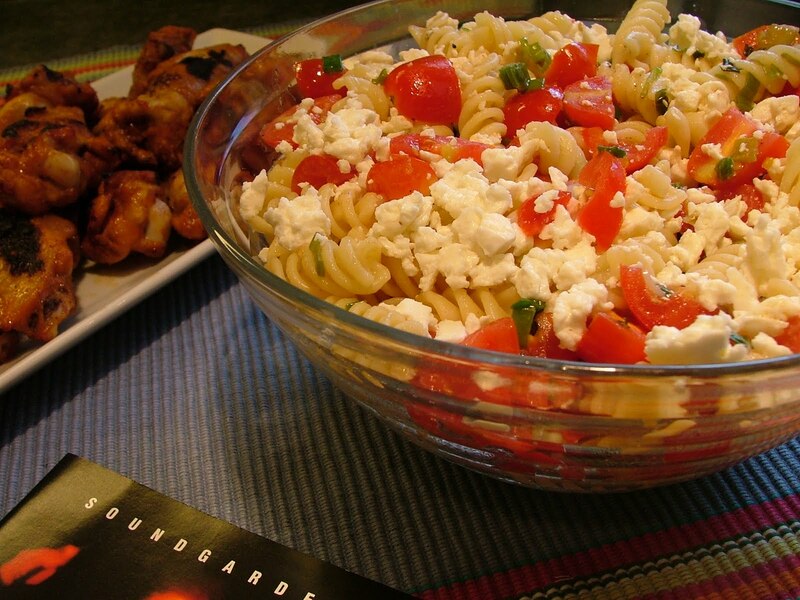 Do you have a favorite recipe that allows you more free time during the summer? In a medium pot, cook pasta according to package directions. Drain and rinse under cold water in a colander. Set aside. In the same pot heat oil over medium heat. Add the garlic and white parts of the green onions. Cook and stir for 2 minutes. Slowly add cooked pasta to the pot. Toss the pasta as you add it in. Remove from heat. Add tomatoes, basil, vinegar, pepper, salt and feta. Gently toss to coat. Transfer to a serving dish before serving.